Totally Bodegas – Which are the Best Wineries in Spain to Visit? 1 Which Region to Visit? Every single one of Spain’s 17 regions produce wines. You might be forgiven for thinking that La Rioja is the biggest producer of wine in Spain because it’s so well-known but it comes in fifth place after Castilla-la-Mancha, Extremadura, Catalonia and Valencia. When we are asked about where to visit we nearly always recommend one of the 69 denominacion de origin (DO) regions which are similar to the French ‘appellations’. 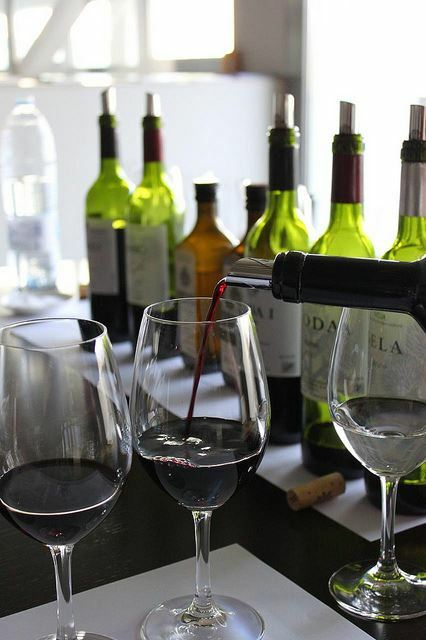 Of these, La Rioja holds the highest number of registered quality wineries, followed by Cava, Ribera del Duero, La Mancha, Cataluña, Penedés and Rías Baixas. We’ll recommend Rioja for those who want to see the North of Spain, Ribera del Duero and La Mancha for those visiting Madrid and if you are staying in Barcelona, then Penedés and Cava are convenient. Rias Baixas is a good option for a Northern Spain self-drive trip or for those also keen to explore Portugal! For clients flying into Seville or Malaga, we recommend the sherry winery triangle especially Jerez. 2 Little or Large – Which Wineries are the Best? With over 4,000 wineries in operation in Spain, we have a lot to choose from. The bigger producers have made it easy to visit their premises with online reservation systems and plenty of information about activities on site. When clients are travelling with a large group or on a very tight deadline we often opt for the large wineries – the names you recognise. But if a client has time to visit a second or third winery – we always book them onto a smaller family run winery also. We know that the smaller winery tours don’t always start bang on time and the mood of the guide (who could be the owner) may depend on whether they are jet lagged after attending a trade fair in China but you know you’re getting a highly personalised tour. Of course, the type of wine or grape is often a key factor for clients. If you look at what Spanish people drink in a bar or restaurant, you’ll certainly see more red wine than white but white wine lovers don’t need to worry because 49 percent of the grapes harvested in Spain are for white wine and the top grown grape variety is actually a white variety called Airén (23.5%). The top red grape is Tempranillo (20.9%) Although many regions are suitable for both red and white wines and most of the larger wineries will produce both reds and whites, if you only drink red wine we would recommend the wineries in La Rioja and La Rioja Alavesa, Ribera de Duero and Toro. 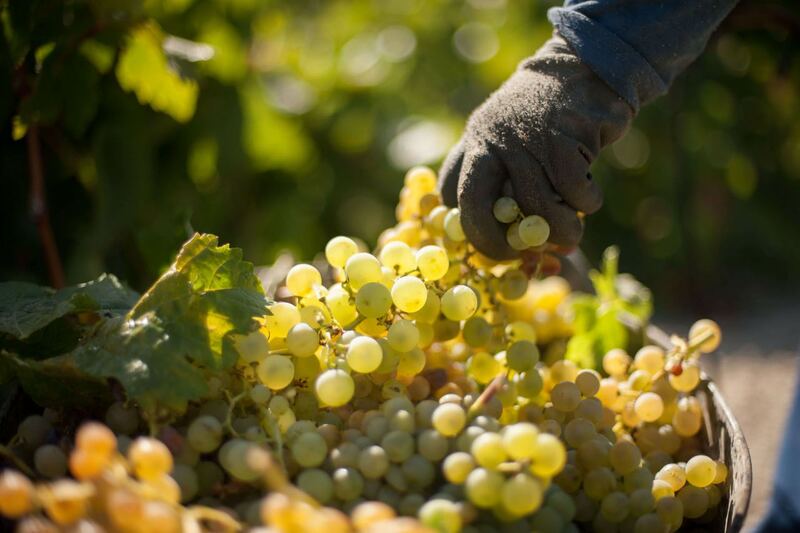 If it can only be white, then consider focusing your trip on Rias Baixas or Rueda. If you are a fan of the bubbly, you are off to Catalonia! 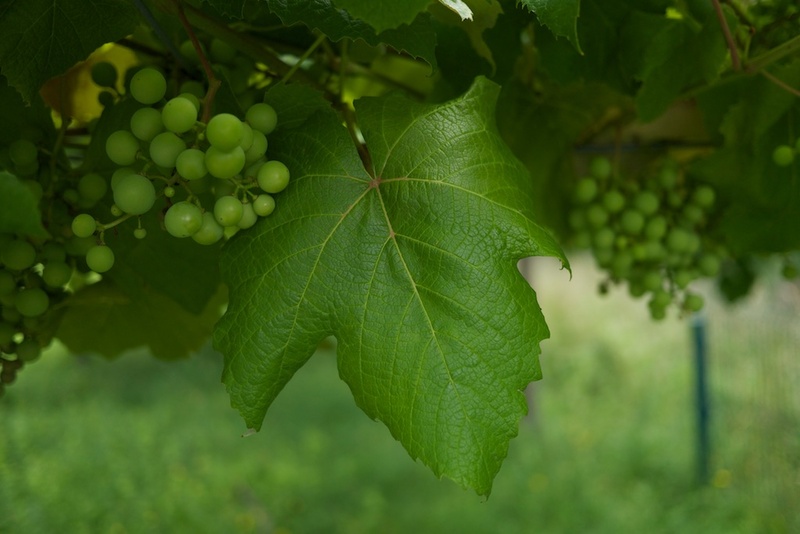 4 Winery Tours In English – Pro-tip: Make Sure to Pre-book! Language may also be a factor in deciding where to visit. Being at an amazing winery in Spain is not much good to you if you don’t speak Spanish and the tour guide or person leading the wine tasting can’t speak English. If you understand Spanish, we recommend selecting one of the mainstream wine regions and also a lesser known one. If you have no Spanish at all, you are best keeping to the larger wineries in the better known wine regions. Even then, you will have to pre-book your English tour in advance to avoid any disappointment. Remember when booking tours that we recommend a maximum of two to three a day. Anymore – even for the pro’s – is a bit reckless as the visits tend to merge into each other. 5 The Wine or the Winery – Which Are You are Interested In? Many wineries have paired up with exciting architects to produce a unique winery experience. 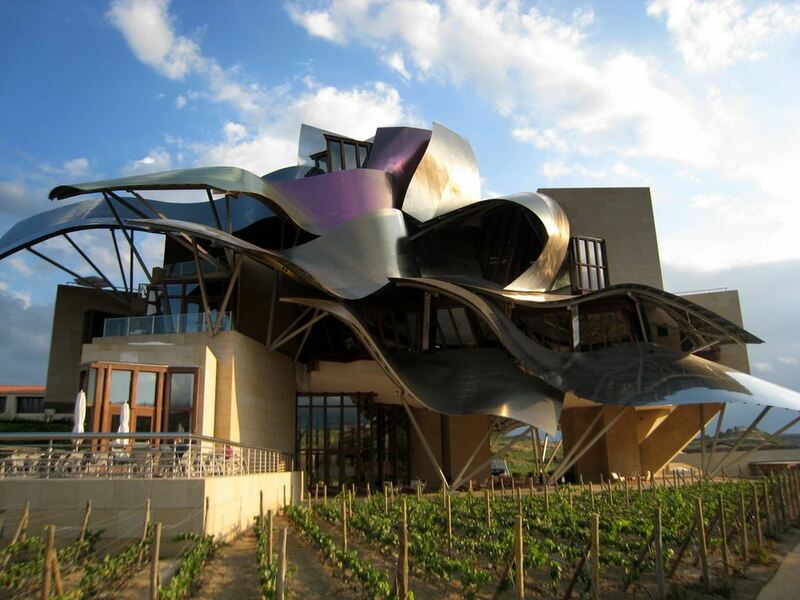 Take for example the Frank O. Gehry Hotel at the Marques de Riscal wineries in La Rioja Alavesa. 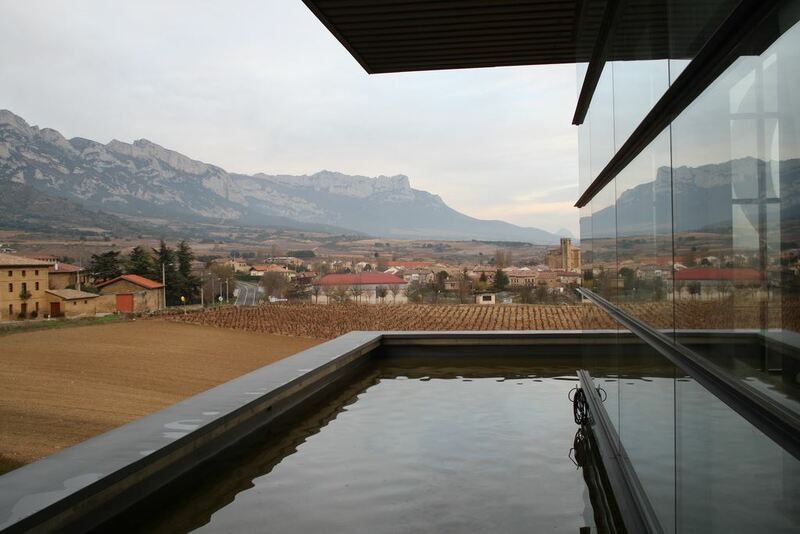 If you want to eat, sleep or even have a pampering at a winery, you’d do well to start your research at the Rioja and Rioja Alavesa regions that seem to be the trailblazers in this. 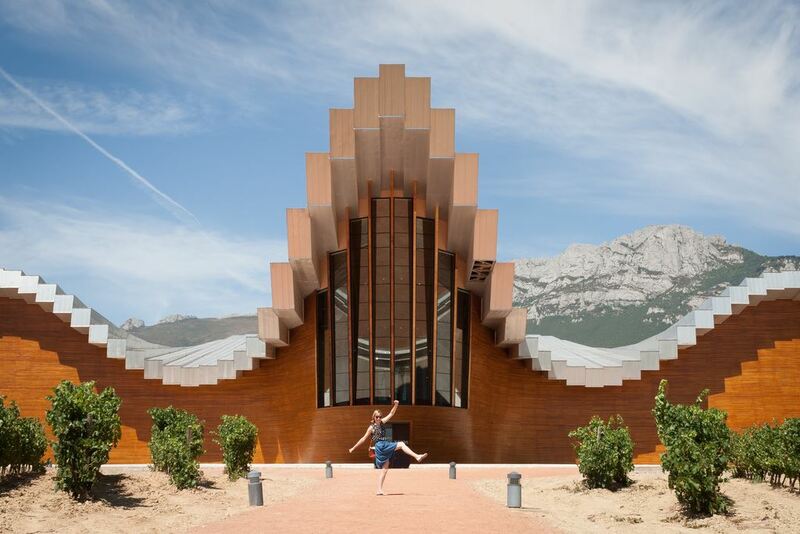 We recommend architecture fans visit Ysios, the new Domecq owned winery designed by Calatrava. And the Philippe Maziéres-designer space at CVNE plus the R. López Heredia Shop by Zaha Hadid. 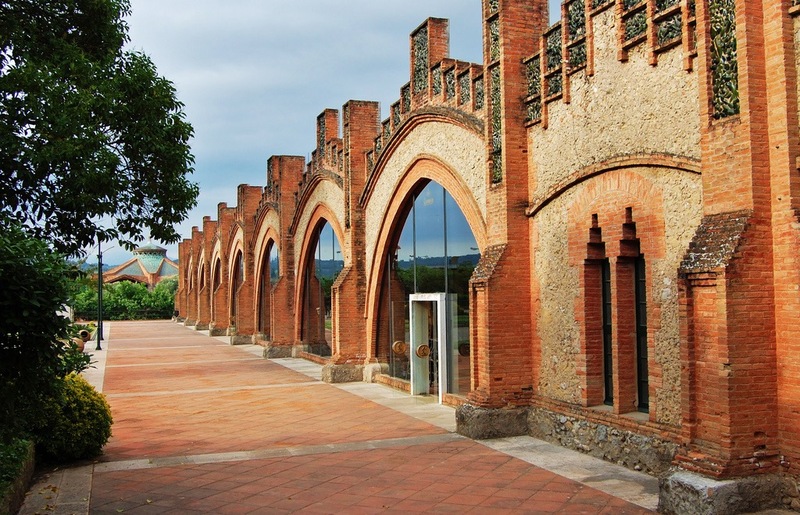 In Catalonia, we adore the Modernist buildings at the Codorniu wineries – which just goes to show that wine and great architecture isn’t a new combination. Lovers of visual arts will also have lots to choose from when selecting wineries and you should read our detailed guide to Wineries with Art – bodegas for all things fine where we recommend the Vivanco Winery and Museum in La Rioja which includes work by Picasso, Sorolla, Joan Miro and Juan Gris and the wonderful collection of art at Bodegas Tradicion in Jerez. This sherry winery has a stunning collection of paintings including work by Goya, Velazquez and Zurbaran. Of course, you don’t need to go to a gallery to see that the creatives are hard at work in the wineries of Spain. 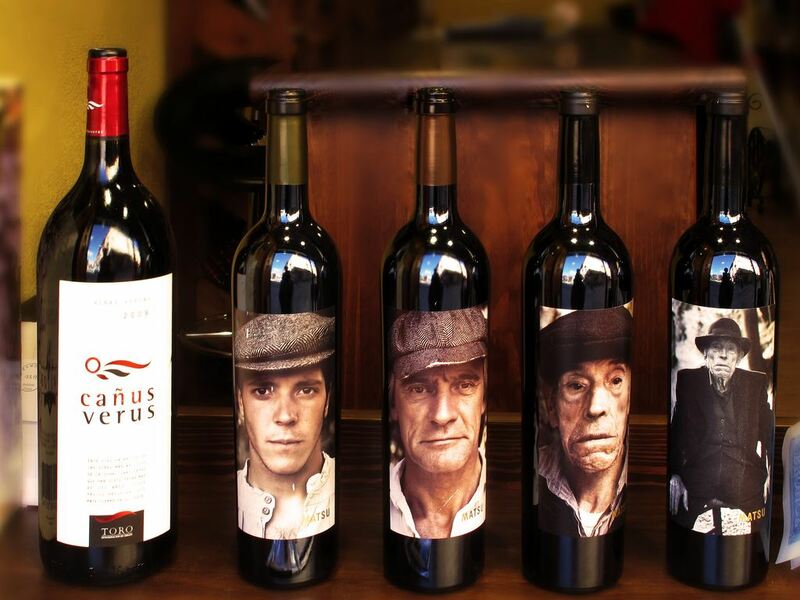 We love Matsu’s labels which feature portraits of three generations of wine makers photographed by well-known Catalan photographers Bèla Adler and Salvador Fresneda. Other labels we like include Lolo by Paco & Lola and of course the cava producers go into overdrive for the festive season. The word ‘maridaje’ in Spanish translates as ‘food and wine pairing’ and it’s one of the most popular ways in Spain to try new wines. Many of the best wineries in Spain have realised this and provide foodie tastings or have set up restaurants in their wineries to provide just that. We love Baigorri in La Rioja Alavesa and there are many many more. The crème de la crème in this sector would be the 12th century Abadía Retuerta near the Ribera del Duero. While the hotel prices are outside most budgets, the food and wine tastings are competitive and the location is certainly a privileged one. 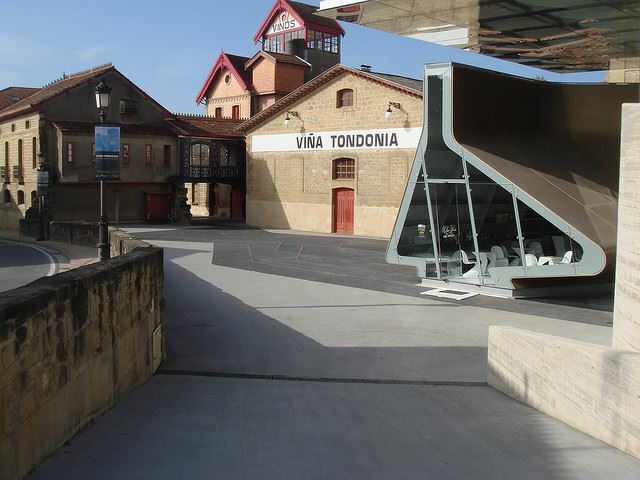 Check out the Segovia restaurateur who created a wonderful winery in Ribera del Duero also. If you want to tasting ‘award-winning wines’ in situ, there are a number of Spanish and international rankings to reference. Many of our US clients like to track Parker Points and if that’s the case for you, check out what Robert Parker’s side-kick in Spain, Luis Gutierrez, is up to before you select your wineries. Names that have done well in the Parker point scale include Pingus, Artadi, Bodegas Alto Moncayo and Clos I Terrasses. El Corte Ingles’ wine department also have a selection of wines scoring 90+ Parker Points which you could check out for pointers of where to visit. 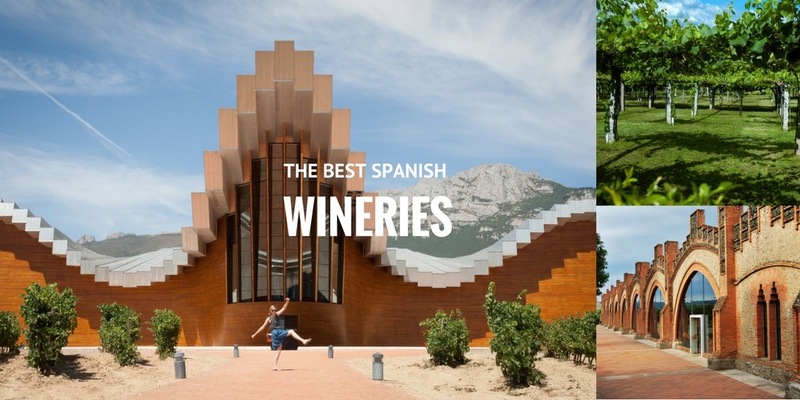 You should check out the Guia Penin for Spain also when drawing up a list of award winning wineries to visit. 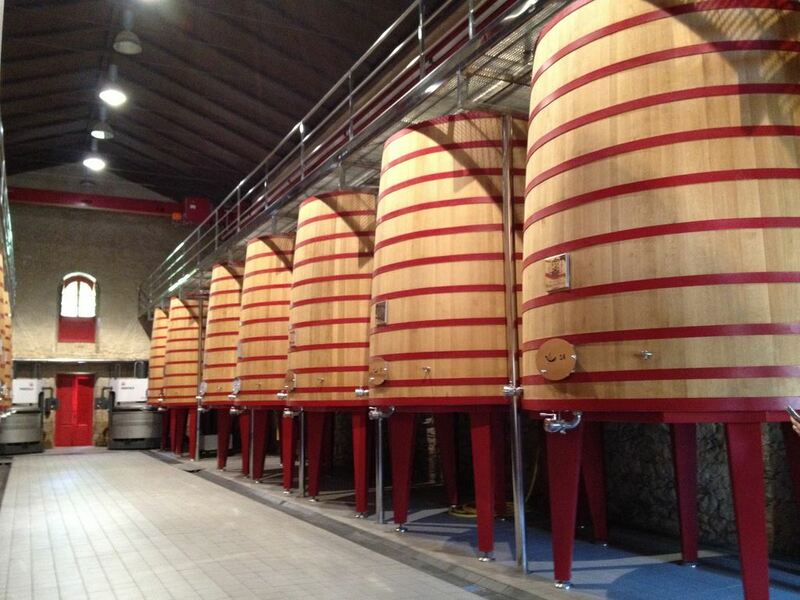 Its 2014 winner of the best winery category was Artadi in Laguardia, La Rioja Alavesa. And the winner for 2015 was Barbadillo wineries in Sanlúcar de Barrameda, Jerez. The DO that stole the limelight in the 2017 guide was Toro. The best wine in 2017 was produced by Alba Viticultores in Sanlúcar de Barrameda for its sparkling Alba Brut Nature 2013. The top DOs in the 2018 guide are Jerez, Montilla-Moriles, Priorat, Ribeira Sacra and Rias Baixas and the best wine is still to be announced but the top 5 wines come from Bierzo, Penedès, Valdeorras, Priorat and Rioja. While it’s traditionally a sector dominated by men, in Spain today you’ll find much is changing. Many of the enologists are women – for example in Marques de Murrieta and Lopez de Heredia (Vina Tondonia) in La Rioja and the Bodegas de Vega Sicilia in Ribera del Duero. Whilst its not generally possible to meet these highly trained women on a visit to their wineries, we know that many of the enologists provide tasting workshops from time to time. Let us know if you’d like to visit wineries with a healthy influence of the double X chromosome. Although its consumption is rather low, Spain is one of the larger producers of eco-wines. You’ll find some of the large producers such as Codorniu getting on board with the organic grapes as well as many of the big Rioja names such as Bodegas Muga and plenty of smaller wineries in this marketplace too. If this is a consideration for your wine-themed tour, let us know and we can put together a programme for you. It might sounds strange to be bringing kids into a winery but we have personally visited many wineries in Spain and Portugal with our girls and have planned countless family trips for clients that take in wineries. Of course, the children don’t taste the wine – but so much of the winery visit is about more than the alcohol. Many winery visits include a walkabout of the facilities and sometimes even the vines. 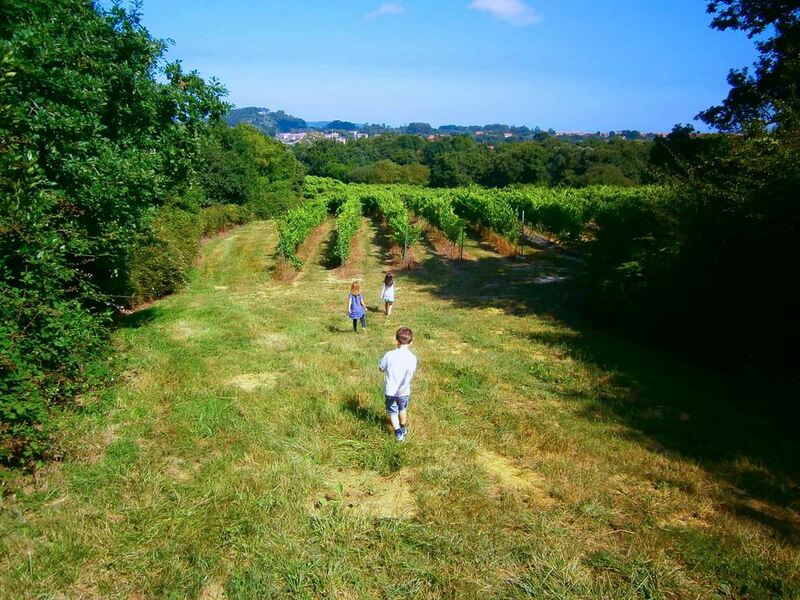 Kids love to run between the vines (as you can see below) and enjoy the outdoor space – and they really enjoy the technical aspects of the production process – seeing the bottles being filled and labelled, and even seeing where the deliveries are going to nationally and internationally. They also enjoy the food pairings and will usually be given a grape juice to sample with the food. When considering a winery visit with children, it’s important to check with the winery first. They will usually say which timeslot is most appropriate and will advise when that’s not the case. Don’t be insulted if you are steered away from a particular time. The best wineries in Spain won’t want to mix a technical or professional group or a press group with a group of young children. Please ask about access if you need buggy-friendly facilities. A chef at Moncloa, the official residence for Spain’s prime ministers, recently published a book about his time there. Curiously he revealed that many of the PM weren’t big wine drinkers. He said that the wines on offer included Rioja’s CVNE and Marques de Riscal, Vinas del Vero in Somontano and we imagine in moderation (but perhaps not) Vega Sicilia from Ribera del Duero. Cavas included Juvé y Camps and Recaredo although Andalucian sweet wine from Gonzalez Byass was swapped in during Felipe Gonzalez’ time in office. We couldn’t write about the best wineries in Spain without mentioning the kosher wines produced in Spain. And the Spanish wineries that have been chosen by the Vatican City. In 2001, Pope John Paul II gave his seal of approval to La Rioja’s Heras Cordon and the winery continues to provide for Pope Francis – who was curiously made an honorary sommelier by the Italian Association for Sommeliers this year. 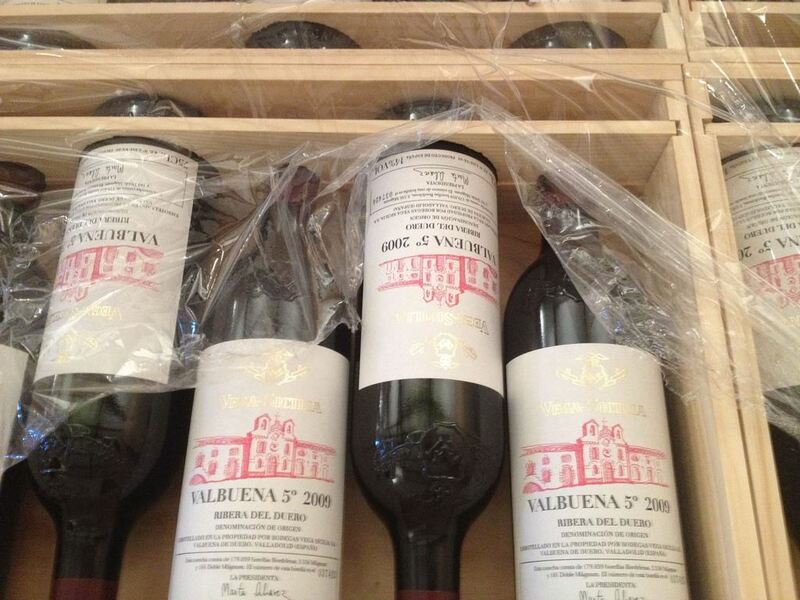 Of course, you can taste the Papal wine in La Rioja as well as Rome. Heras Cordon has a private dining room which is perfect for tastings and group events. Fellow Spanish wineries Vega Sicilia and Viña Pedrosa also supply papal demands for red wine in Rome and we understand a white from Rueda is also dispatched. We’ve never prepared a papal winery tour of Spain but it’s not a bad idea for an itinerary, is it? We can also arrange kosher winery tours and tastings. 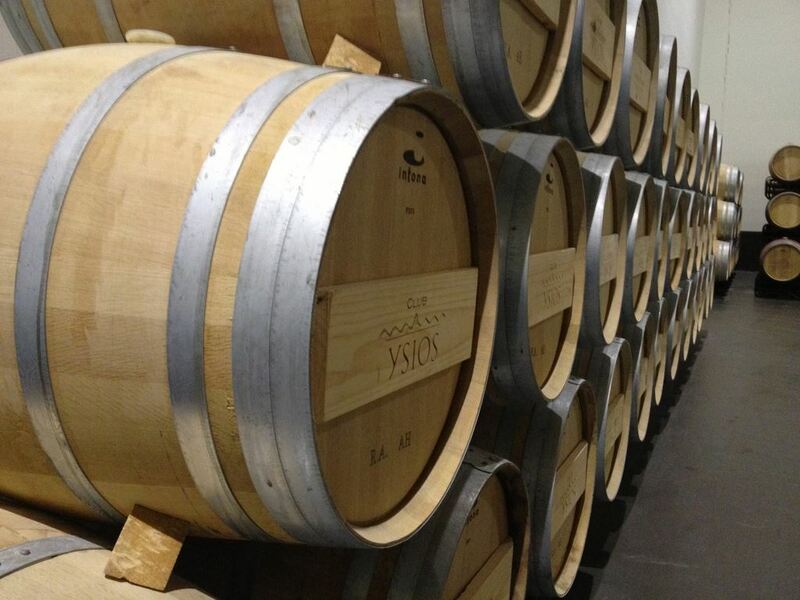 The first winery was the Celler de Capçanes co-operative in Tarragona which now produces four kosher wines. 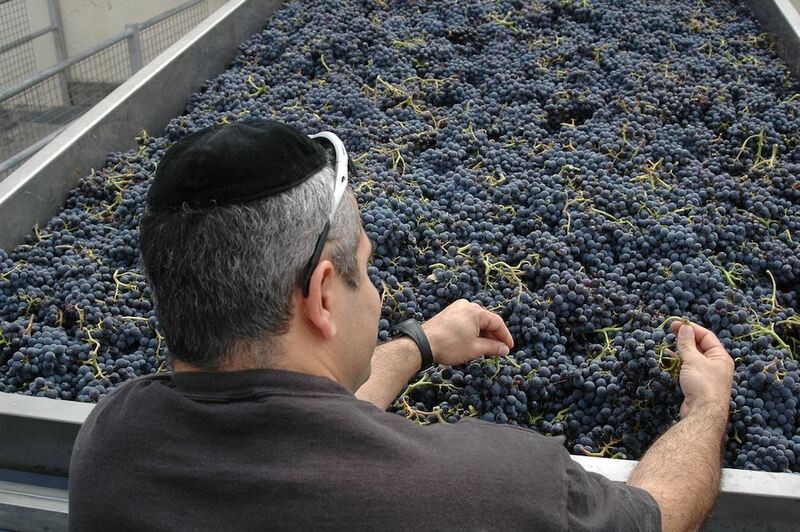 Visits to the winery include a detailed explanation of the art of kosher winemaking. This could make a very interesting add-on to a Sephardic themed tour of Barcelona, Besalu and Girona in Catalonia. 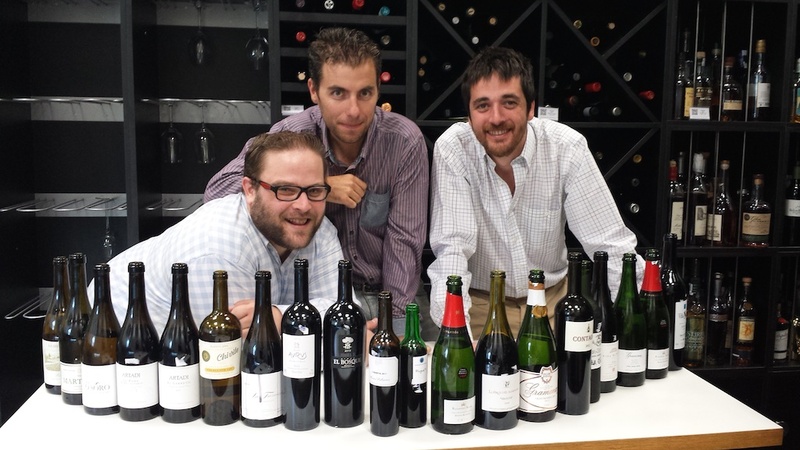 More Spanish wineries are beginning to service kosher demand and in La Rioja, the well-known Haro winery Bodegas Ramón Bilbao has produced kosher wines. 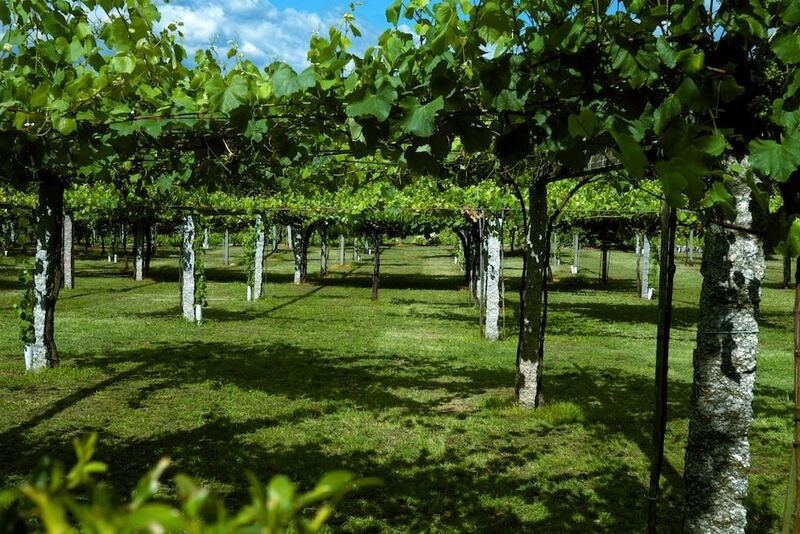 Smaller wineries are also getting involved – the Laguardia-based Bodegas Ruiz de Vinaspre produces wine for the kosher market from time to time at its winery is located right beside the Ysios winery. 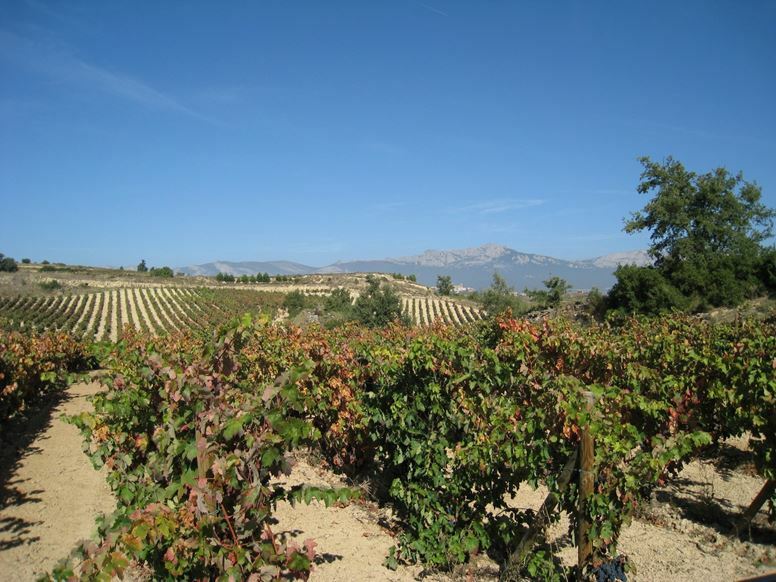 Bodegas Castillo de Sajazarra also produces kosher wine from its winery located 15km from Haro in La Rioja. We can arrange tour of these wineries as a stand alone trip or part of a wider itinerary through Sephardic Spain and Jewish Portugal. 14 Can’t Drink or Not a Fan of the Grape? What do you do if some of your party is not interested in wine? Start by checking out what other drinks are native to the region you are visiting. For example in the North of Spain, you’ll find many cider producers, distilleries of Orujo, Pacharan and vermouth. Many of the breweries are also offering great tours and tastings for example Dougalls microbrewery in Cantabria. If aren’t able to or chose not to drink alcohol (for religious reasons, are taking medication, pregnant, are the designated driver etc), and you are at a wine tasting, you can choose to taste the drink and then discreetly spit it out. We’ve seen it done at many of the tastings we attended – and all the pro’s do it at the industry events. If you are the designated driver, you might want to check out the benefits of hiring a private driver in Spain for winery visits. If you are a teetotaller, have a read of our guide on Spain’s non-alcoholic drinks. We hope we’ve shown you how many different tangents a wine-themed trip can take in Spain and how vibrant and forward looking this sector is. We’ll leave you with a few links to our winery guides to La Rioja, Rioja Alavesa, Ribera del Duero, Rias Baixas, Jerez and Cantabria. Posted in Andalucia, Food & Drink, Galicia, Insider Spain Guides, Jerez de la Frontera, La Rioja, Popular Posts, Rioja Alavesa, Wineries and tagged Artadi, Baigorri, Barbadillo, Calatrava, cava, Codorniu, CVNE, Gehry, Guia Penin, kosher wine, Marques de Murrieta, Marques de Riscal, Matsu, Muga, Parker points, Rias Baixas, Ribera, Rioja, Roda, Vega de Sicilia, Vina Tondonia, vino, Vivanco, wine, wineries, Ysios.